Gentlemen, even if you choose to ignore all of the other suggestions that I have made over the last year, please consider changing your shaving routine for the better. I hate to badger you about it but, please, if you wet shave, use a shaving brush. Last week, in an effort to economize in packing, I neglected to pack my shaving brush, DE razor and soap, electing to lug along a high-tech multi-bladed vibrating plastic razor and can of equally high-tech and similarly branded gel. I spent the week looking like an accident victim. First cut to ribbons, then stubbly, then cut to ribbons again. I shaved twice. It was all I could do to bear the experience. Upon my return I was happily reunited with my brush, mug, bowl and Merkur razor. My mug is smilingly smooth once again. 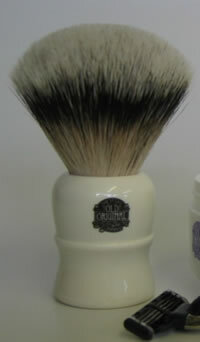 Shaving brushes are available from many sources, The Art of Shaving, Truefitt and Hill, Geo. F. Trumper, Amazon and Progress Vulfix to name a few. Classic Shaving has all the products (and product knowledge) you could wish for and the service, while slow, is steady. Ignoring the handle design and material, it is the business end of the brush with which you should be most concerned. As with most things I recommend, you would do best buying the most expensive you can afford (it will last forever.) That means staying away from the synthetic bristle options. Wet shaving is supposed to be just that — wet. Synthetics simply can not hold the requisite amount of water you need to get a close and comfortable shave. For the budget conscious, boar bristles are softer, hold more water than synthetics and are not that much more expensive. But what really does the trick, is badger bristle. Like most things these days, badger bristle comes from China, so don’t let that concern you. There are three grades of badger bristle that increase in price depending on how much of the badger they formerly covered. Pure Badger Bristle is what covers most of the badger. As such, it is a little more coarse and stiff. Best Badger is somewhat more expensive as it covers less of the animal and is longer in length, making it more supple. Silvertip (or Super Badger) is hair taken from the chest and neck area and is the most expensive. Think of it as cashmere. It is tan with a darker bands around the shaft. The silvertip bristles flare more than the others and are more thermally insulating for the animal. That flare lets them hold more water, which in turn produces more lather and a very soft and luxurious lather up. I have all three sorts and while the difference between pure and best is noticeable, it isn’t earth shattering. My silvertip brush (with Waterford crystal handle — never do that again, soap and water are slippery some mornings, and crystal chips) is decadent. Why not inject a little luxury into your mornings and get a closer, more comfortable shave to boot? The badger bristle shaving brush is the easy and elegant solution. This entry was posted in Living and tagged grooming, Living, resources, shaving. Bookmark the permalink. I have been using a brush for about a year, now, and can’t believe what I was missing for so long. Shaving used to be a chore, now it is a pleasure. I also find my wife watches me shave more often. She says using a brush just seems more “manly” as opposed to smearing goo all over your face with your hand. Who am I to argue? My dad always referred to shaving as “cold steel and the badger”. I thought it an elegant turn of phrase. I’d love to think he came up with that one himself. BTW – he used a badger brush, though he didn’t use a straight razor. Turling, it really does make all the difference, doesn’t it? I can’t imagine anyone not using one. Why add an extra chore to the day? SWMBO, wonderful handle, from the book “She”? Or the Galloping Gourmet? There is a great site dedicated to wet shaving called BadgerAndBrush.com. Your father’s phrase is very elegant — reminiscent of Anthony Montague-Browne’s assessment of the British Navy. Yes the travel version is well worth it. I have the tube variety, and I carry a tube of rose-scented shaving cream from The Art of Shaving.